By 1917 the government was encouraging Councils to think ahead and Harston assessed what extra housing it needed, or improvements or replacement of those in poor condition, for the Working Class and what sites for building might be available. Lloyd George promised “Homes fit for Heroes” at the end of WW1 and for the first time, as a result of the 1919 Addison Act, the government provided councils with subsidies to build a good standard of housing, particularly for the working class. Councils took up the opportunity to become providers with the subsidy arrangements sharing the costs of this new housing between the tenants, local rate payers and the Treasury. Initially, the building standards were high as they planned to provide three bedroom houses with plenty of space and large gardens to enable tenants to produce much of their food, a great improvement on some of the dilapidated rural housing. The rents, however, were too high for many poorly paid rural workers. As a result of the 1919 Act three pairs of semi-detached houses were built in Church St, Harston and still look as their original design today. They were spacious and had long gardens, enabling occupants to grow their own food. The long gardens originally were part of a pasture known as Camping Close. (Most are now privately owned due to the later right to buy scheme). Due to this three grants totalling £212 were given to subsidise private builders in Harston, which enabled those who could afford it to buy homes. This act increased government subsidies to be paid to local authorities to build housing and extended the time over which the subsidy was paid from 20 to 40 years, the main aim being to secure a continuous supply of housing for the next 15 years. Rents were to be lower – from £6 to £9, affordable for lower wage earners. However, the high building standards were gradually reduced, due to cost considerations, resulting in a reduced size and houses developed at a higher density. For instance, during this period, a new three bedroom house was often only 620 square feet compared to over 1000 square feet in 1919. New council housing was gradually becoming labelled for the very poor but despite this they generally continued to provide good quality accommodation. Some were also the first to be equipped with a bathroom instead of a bath in the scullery. The 1930 (Greenwood) Housing Act further reduced rents, re-housing some of the poorest people in society, as previous allocation had still been based on people’s ability to pay the rent. 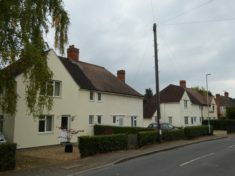 In Harston a number of houses in different places were built as a result of the 1924 Act giving the council subsidies to build. Two semi-detached houses – No’s 16 & 18 Church St – were built in 1924 after the council had bought and knocked down 3 cottages fronting too far into the road next to Pantile Cottage. They also built a further 4 pairs of semi-detached houses along the Footpath not long after. No’s 2 & 4 the Footpath have since had another house built adjoining each end of the pair- possibly in 2005 and 2010.Does anyone know when they were built and by whom? Council/Housing Association or private? Two semi-detached council houses, No’s 8 & 10 Button End were also built around 1924. After the Swan Inn burnt down opposite The (Swan) Green in 1928, four semi-detached council houses were built in 1930 on part of the site. The Greene family of Harston House, who owned much of the land and premises around the Green had much input into the design of the houses, trying to fit them in with the character of this old centre of the village. The first 8 semi-detached council houses in Manor Close were built around 1931 on land that used to be part of old Manor House Farm (which had its farm house later destroyed by fire when occupied by the army in WW2). To begin with, water had to be collected from a pump at the High St end of Manor Close. The houses had big gardens so they could grow their own vegetables. Later the council took this space to build more houses on in the 1990s, building the new between the old and taking the gardens of the top end for bungalows in Queen’s Close. This resulted in two grants amounting to £182 being given in Harston for re-conditioning four cottages. Button End land was sold by Jesus College to Chesterton RDC in 1937 for Council Housing. Three pairs of semi-detached houses (No’s12-22) were built by the council mainly for agricultural workers and had no parlour, just one room with a scullery. They had an outside coal house and toilet accessed from the outside as there was no plumbing. There were no drains to take the sewage away so they dug holes in the garden and buried the waste, probably one of the reasons they had a big garden apart from growing their own vegetables. They had a copper to heat up the water for bathing – the reason for the 4 chimneys on the house roofs. They had no electricity for the first year as farmer Crow objected to lines going across his fields. Candles were used. Later the residents converted the coalhouse and outside toilet into an inside shower/bathroom and the scullery to a proper kitchen. (See Gerald Ives memories for a detailed account). But it was not until after World War II that the age of the council house truly arrived. Largely to replace those destroyed by Hitler, Clement Attlee’s post-war Labour government built more than a million homes, 80% of which were council houses. A generation was introduced to the joys of indoor toilets, front and rear gardens, and landscaped housing estates. Many houses in Queen’s Close were built about 1952/3 around a Green and some trees still remain from the orchards originally there. They initially had 3 bedrooms, a big garden and an upstairs bathroom with bath and basin. The toilet and coal house was just outside. Later the council added a toilet in the bathroom upstairs. In 1955, near the London Rd entrance to Queen’s Close, Cambridge County Council built a pair of houses for District Nurses with some District rooms. The council bungalows were added later, taking land first from the south side of New Road before 1971, then taking the long gardens off the top end houses in Manor Close after 1971. 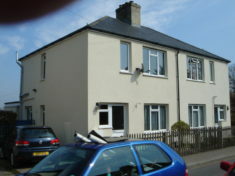 More houses were added in Meadow Way in the 1990s. Does anyone know the date exactly? Meadow Way Community Centre off Queen’s Close was added in 1994. There are over a hundred properties in the Queen’s Close/Meadow Way area but a significant number are now privately owned due to the right to buy scheme. This page was added on 08/01/2018.